In addition to his high scholastic achievements, Alex is a member of Student Council, Student Ambassadors, Students of Stewardship, The Ursuline Golf Team, as well as other Ursuline groups. He is also a member of the Speech & Debate Team where he has been earned the title of State Champion in Congressional Debate. Alex is a member of Saint Charles Parish and is a graduate of the school. 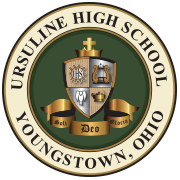 Ursuline’s long standing tradition of academic excellence is highlighted by our long history of National Merit Scholars. Congratulations, Alex!